Who should not take Antabuse? What conditions does Antabuse treat? Tell your doctor right away if any of these unlikely but serious side effects occur: decreased sexual ability, vision changes, numbness/tingling of arms/legs, muscle weakness, mental/mood changes (e.g., agitation, extreme excitement/confusion), seizures, confusion. This drug may rarely cause serious (rarely fatal) liver disease. If you notice any of the following unlikely but very serious side effects, tell your doctor right away: persistent nausea/vomiting, severe stomach/abdominal pain, dark urine, yellowing eyes/skin. List Antabuse side effects by likelihood and severity. What should I know regarding pregnancy, nursing and administering Antabuse to children or the elderly? This drug should not be used with the following medications because very serious interactions may occur: alcohol-containing products (e.g., cough and cold syrups, aftershave), metronidazole. If you are currently using any of these medications listed above, tell your doctor or pharmacist before starting disulfiram. Before using this medication, tell your doctor or pharmacist of all prescription and nonprescription/herbal products you may use, especially of: amitriptyline, "blood thinners" (e.g., warfarin), certain medications for seizures (e.g., hydantoins such as phenytoin/fosphenytoin), isoniazid, theophylline. Does Antabuse interact with other medications? Should I avoid certain foods while taking Antabuse? 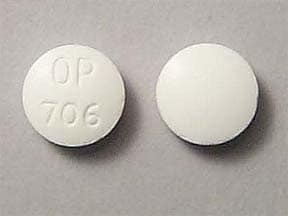 This medicine is a white, round, tablet imprinted with "OP 706". 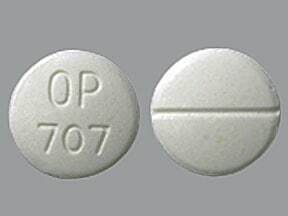 This medicine is a white, round, scored, tablet imprinted with "OP 707". Are you considering switching to Antabuse? How long have you been taking Antabuse?